I am trying to create Multi Page Multiple Question Form in JotForm. I am able to get the option to create multiple questions in one page but not getting the option to create multiple pages where i can input multiple questions. 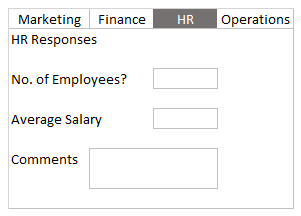 For Example, i want 4 pages with headings - Marketing, Finance, HR & Operations and each of these pages should have multiple questions. Attached mock-up. Is that possible? How to create that? This can be achieved by adding PAGE BREAKS to your form. In case you need more help, don't hesitate to let us know.